Though their visit was a short one, Kevin and I loved our time with the Lovatts (we always do), and enjoyed a dinner together at Jeffrey Adams following the awards ceremony last night. For breakfast this morning, I made a baked oatmeal dish (one I’d never tried before, but it was a variation of a recipe from my friend Teri’s blog so I knew it had to be good). And it was delicious! I modified the recipe slightly to take it from gluten-free to, well, everything free (except taste-free, that is). 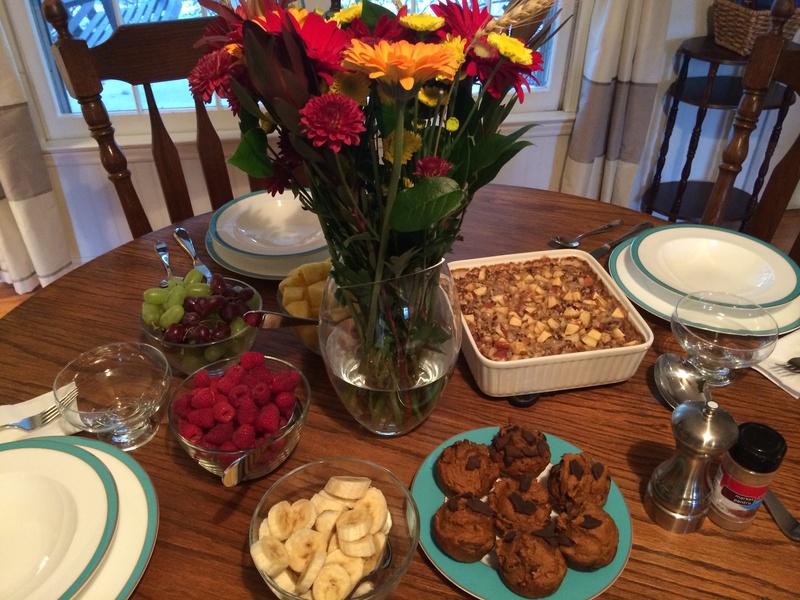 It’s devoid of gluten, dairy, and eggs, and is completely vegan, so anyone can enjoy this perfect-for-fall breakfast. Another bonus: The only sweetener used in this recipe is pure maple syrup, so you can feel extra great about serving this to friends and family. Preheat the oven to 375 degrees and spray a 9-inch by 9-inch baking pan with cooking spray. 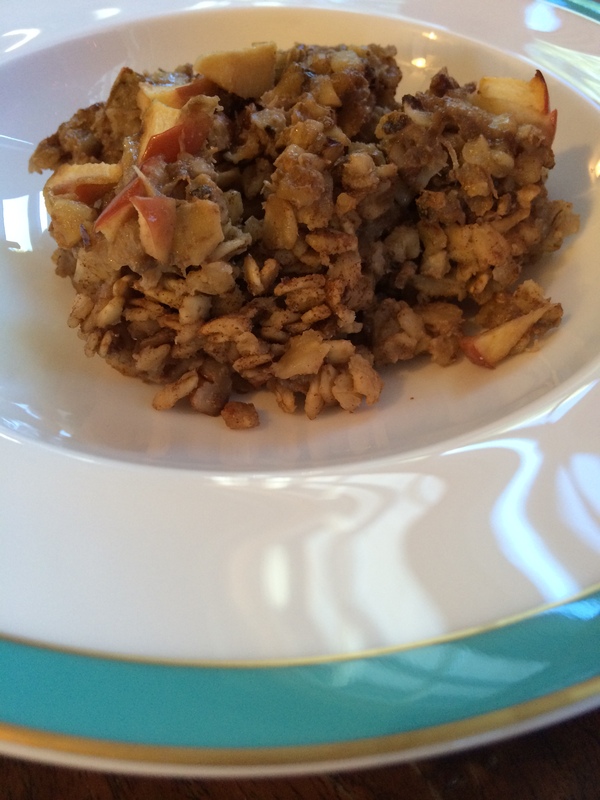 Combine the oats, baking powder, cinnamon, salt, 1/2 cup of the pecans and half of the diced apple. Stir to combine and spread into the greased pan. 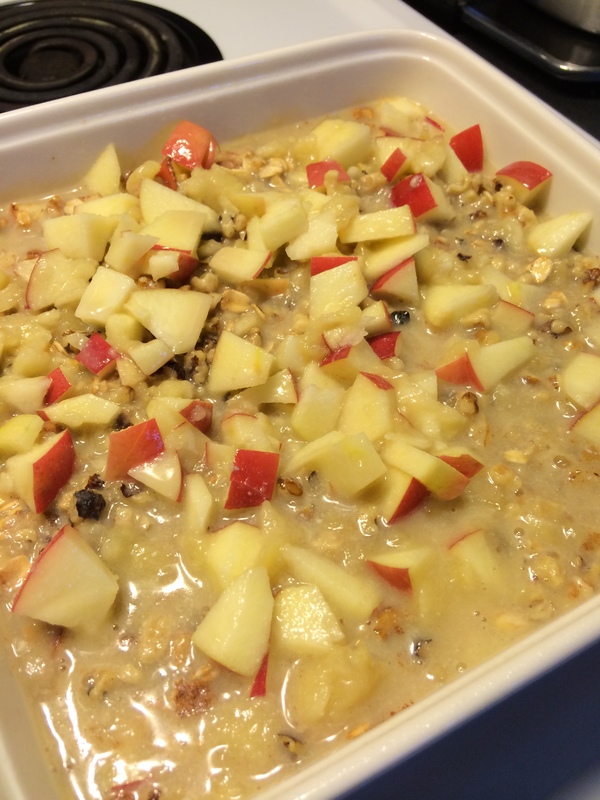 Sprinkle the remaining apple and pecans on top. Whisk the maple syrup, milk, mashed banana, Earth Balance, and vanilla extract. Pour over the oatmeal mixture. Bake for 30 to 35 minutes until the dish turns golden brown and the liquid has set. 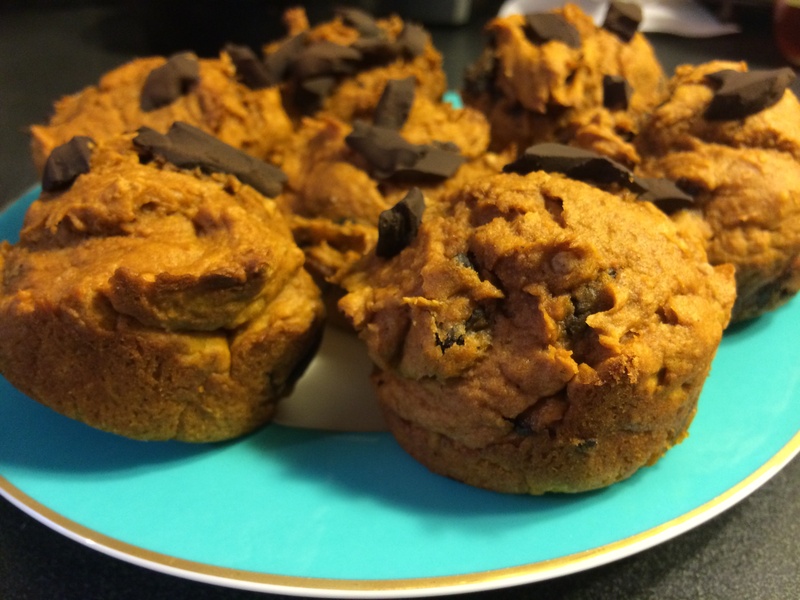 Oh, I also whipped up another new recipe — these super easy pumpkin chocolate chunk muffins that I got from my friend Emily’s blog. Three ingredients — that’s it! As for leftovers for this delectable oatmeal? I feel like it could be excellent whipped up with some yogurt, 1/2 a frozen banana, and turned into a smoothie. Who’s with me? Anna, great to have the opportunity to spend even a short time with you and Kevin. Loved your house and your dog and that fantastic oatmeal: simply delicious. Must say that I prefer this to oatmeal in a bowl because it’s easy to add enough toppers to oatmeal to make it dessert. This was healthy and scrumptious. Thanks for sharing.